The problem I had was I took too many photos, which were stored on my phone’s micro SD card. I transferred them to my PC, as I wanted to use some on an upcoming Facebook fan page. 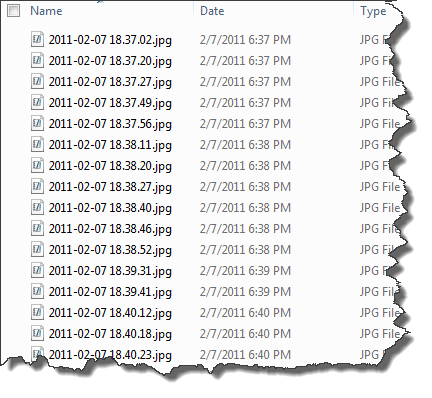 I ended up with an array of files that seemed identical, but varied by date. The file names certainly didn’t provide a clue as to whether the subject matter was my Oregon trip, wine labels, twins or something else. Does the example picture below look familiar to you? After looking at the filenames, I figured I needed a way to rename files. My first thought was I could probably write a DOS batch program using the RENAME function. My second thought was the cold medicine I was taking was interfering with my thinking as someone has surely tackled this problem using Windows. I was correct on one hand as there are many file renaming programs. I first tried other free ones and found them OK, but not easy. I know that probably sounds strange after my comment about writing a DOS batch file. I wanted a program I wouldn’t have to relearn each time I needed to use it. After doing more research, I found an application called RenameMaestro. At first glance, I thought maybe the program was too much for me as the opening line read “Looking for the easy way to batch rename files and folders by the million?” Uhm…no, I only had a couple hundred photos to rename. I quickly spotted another button that said “60 second Tutorials” with some amusing scenarios and I felt better. In my case, I wanted to rename a batch of photos I took with the twins that I put in a separate folder. I dragged that folder from Windows Explorer and dropped in onto RenameMaestro. I used the Single Action Home feature, as I wanted to replace the date portion of the file name (2011-02-07) with something that better identified the pictures (twins-fbfp). Next, I clicked Easy Rename and typed my descriptor in the textbox. At that point, the program previewed what the new file names would look like in the Renaming Preview section on the right side. 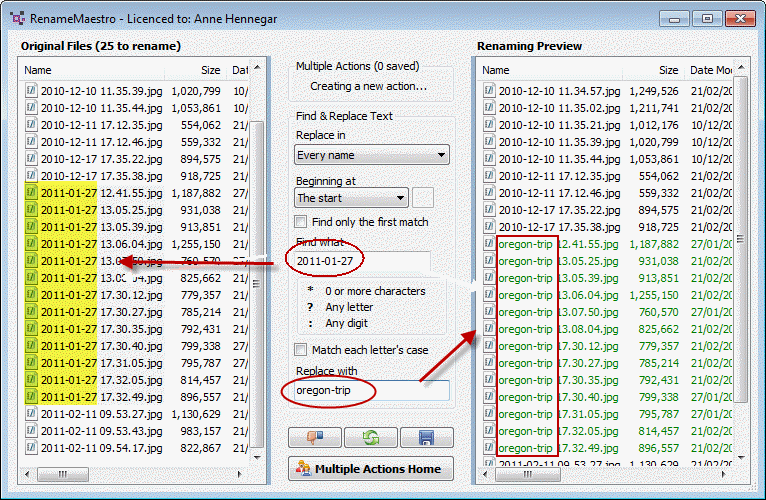 You can also see in the example below, the program appended the sequence number to each file name. Until I hit the Rename!>> button, I could edit or undo my action. As you’ll see in a later screenshot, I did change the insert text value and added a hyphen. In some cases, you may not want to rename the whole folder contents, but only files containing specific text in the file name. Again, renaming is very easy with a “search and replace” feature. In the example below, I wanted to rename photos from a certain date to reflect when I was in Oregon. I simply typed 2011-01-27 in the Find What textbox and oregon-trip in the Replace with textbox. The program also allows you to use various wildcards for letters and numbers. If I had more files with this pattern, I could save this “action” and reuse it later. The program can do a lot more than what I demonstrated above especially when you build and save “actions”. When you play around with the options, you’ll see that you can extract Meta information from files and use those data elements as part of the file name. 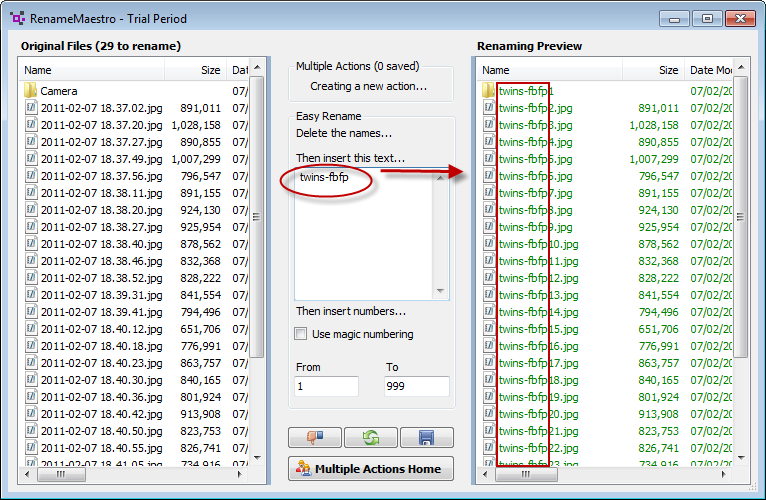 As example, with photo files, RenameMaestro can read the EXIF information. This is a nice feature if your camera captures geo-location codes. I quickly found another use for this File Information feature. I constantly download programs I plan to review. Many times those file names are cryptic or have the generic name of setup.exe and by the time I get around to them, I haven’t a clue about the program. Now, I can drop my “saved downloads” folder in RenameMaestro and presto I can see things like company, comments, version, file description etc. without needing to rename files. Instead of seeing something like SFTPMSI.Exe and guessing what it is, I can now see it’s the setup file for Smart FTP. These Meta information fields also change based on file type so the MP3 files with have different fields from a PDF file. 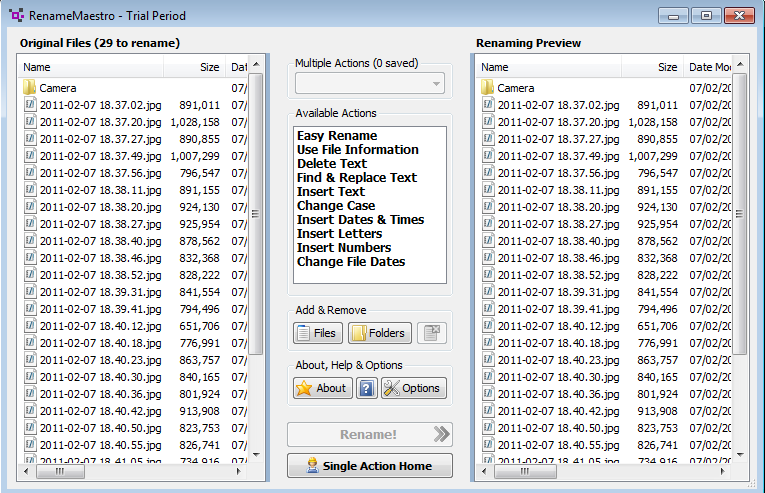 After using the program for several days, it is as the developer states on the site, “the easy file renamer”. While there are many free programs, I might've had a steeper learning curve, which would cost me time in the end. Also, the developer has now made this program free.